Dear Sir, Thanks for your kind consideration of our Company, A.G. 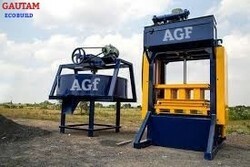 FOUNDERS & ENGINEERS, in your need of Concrete /flyash Machinery/Moulds. We are pleased to forward our Best offer for Your inquired Product Catalogue & Technical Details for your kind consideration. We herewith take a chance to introduce ourselves Leading Engineering Company engaged in the design, manufacturing, supply & servicing of Best Quality Equipment's like Automatic Fly Ash Bricks Plants, Automatic Concrete Blocks Plants, Automatic Pavers Blocks Plants & Automatic Material Batching & Feeding Systems Rubber /Pvc Paver Moulds, Wall Tile Moulds, Plastics Paver Moulds, Plastic Tiles & Interlock,rubber paver moulds & Tiles Making vibrating Tables,pan concrete mixer,color pan mixer, fly ash blocks machine ,hollow/solid concrete block machine pan mixer,concrete mixers lift hopper,wet casting machinery . We are having core expertise of Design, Manufacturing & Servicing of Bricks & Blocks Making Machinery for more than aprox .20 Years. All of the Equipment's offered by us are manufactured under strict quality conditions & fitted with Best Quality bought outs to let them run years after years without any trouble. The same equipment's are also backed with the Best after Sales Services all over India. We hope you will find this offer as per your expectations & hope to here from you soon. Please confirm your receipt of this mail. Please do not hesitate to call or mail us if any type of additional information is required. +91-9872428844(Available Whats app.) A.G. Founders & Engineers have gained success in the market by manufacturing and exporting a wide collection of Brick And Block Making Machine, Construction Machinery, Tile And Stone Moulds, Paver Block PVC Mould etc. We provide these products in construction and many more industries. We are a well known Sole Proprietorship company that is incorporated in the year 1990. Located at Batala (Punjab, India), we have developed an ultramodern infrastructural unit that assists us to meet the varied needs of the clients in a predefined time period. Controlled under the supervision of our Mentor “Mr. Gautam Aggarwal”, we have gained huge clientele across the nation. We generally export these products to UAE, Oman, Africa countries, Bangladesh, Sri Lanka, Bhutan, Ethiopia, Kenya, Lebanon, Jordan, Mexico, Nepal, Nigeria, Philippines, Qatar, Saudi Arabia, Rwanda, Zambia,Congo, Sudan, Somalia etc. We are offering our products under the brand name Gautam.